A minor girl, hailing from Maharashtra, was allegedly beaten to death by the granthi of a Sikh shrine in Khara village in Tarn Taran district near here. The victim, Puja (9), who was named as Manpreet Kaur by the family of the accused had complained to the residents of the village about the physical and mental torture she had to go through, a couple of days before her death on September 23. The State Special Operation Cell, a counter intelligence wing of the Punjab police today arrested a notorious smuggler, Darbara Singh today. The arrest followed an encounter with the police near Bhakna-Chicha road late last night. Banking on the tried and tested formula of celebrating friendship lasts forever on screen, comes another Punjabi flick Yaar Anmule. The cast of the movie, including Yugraj Hans, Jenny and Kajal Jain were in city to promote the film and visited religious shrines to seek blessings for the success of their film today. Members of the Guru Nanak Dev University Teachers' Association have questioned the sanctity of the teachers' body. The president of the association Balwinder Singh has called an emergency meeting of the association tomorrow. The state-wide Pulse Polio campaign, that started today, was affected due to the ongoing strike by auxiliary nursing midwives (ANMs) and lady health visitors (LHVs). The second phase of the biannual Pulse Polio campaign witnessed absence of ANMs and LHVs. First phase of the polio campaign was held in the month of February. Even as the supplementary examinations for BA/BSc/BCom and other undergraduate courses are scheduled to begin from September 26, the Guru Nanak Dev University authorities have failed to declare the results of the re-evaluation results so far. Failure of the examination branch of the university in declaring the results of the re-evaluation exams is said to be the reason behind the same. Former officer of Israel’s Special Forces, Itar Dar, stressed the need for specifically trained workforce to handle any eventuality in hotels. He was delivering a lecture on the concluding day of Hotel and Restaurant Association of Northern India (HRANI) convention here today. The family of handloom weaver Bansi Lal of Haripura area was in a state of disarray when his palm had to be amputated after it got entangled in the loom. Fortunately, he had got him insured under the Group Insurance Scheme being offered by the Ministry of Textile following the advice of one of his friends. He had enrolled himself under the scheme last year. Members of the Midday Meal Workers Union and Part Time Sewing Teachers Union today held a protest in favour of their demands in front of the residence of Social Welfare Minister Lakshmi Kanta Chawla. The agitating members maintained that they were being paid meager salary while the inflation was soaring at its highest level. For this, they flayed both Union and state governments. For an artist, the best possible promotion is to let his work do the talking. But sometimes even that needs a little push. And one such effort comes in the form of the workshop of contemporary artists from Punjab that opened at the KT Kala art gallery today. Amritsar: Players from the city dominated the second day of the 6th Punjab State Yoga Meet being jointly organised by Punjab Women Yoga Association and Punjab Yoga and Culture Association at Yog Sadna Ashram Goal Bagh here. The police had earlier initiated action under Section 174 of the CrPC, has now registered a case under Section 304 (culpable homicide not amounting to murder) and 34 of the IPC against Sukhdev Singh, the granthi of a gurdwara in the village and his wife Jasbir Kaur, in this connection. 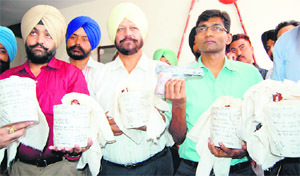 The case has been registered on the basis of the statement of Manjit Singh, former member of the village panchayat. As per information, she was brutally beaten up by the accused a few days ago. She somehow managed to escape from the house of the accused and took shelter in the house of Manjit Singh. She had alleged that Sukhdev had brought her from Nanded few months back and treated her very badly. 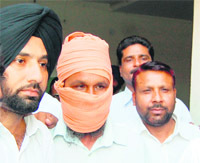 The accused used to make her work her at a dera, the deceased had alleged. The matter was taken up in the village panchayat, which allegedly did not take the matter seriously and sent her back with Sukhdev Singh after he tendered an apology for his conduct and promised the panchayat that he would take very good care of her. On the very next day she was found dead, owing to internal injuries caused by the alleged thrashing by the family. SSP, Tarn Taran, Manminder Singh, said, “As per the preliminary investigations, the accused had assaulted the deceased as she refused to go to school and the internal injuries caused due to the same proved fatal for her." The accused had adopted the girl and she was the daughter of his sister-in-law living in Maharashtra, he added. He said the law would take its own course and the culprits would be brought to book. The State Special Operation Cell, a counter intelligence wing of the Punjab police today arrested a notorious smuggler, Darbara Singh today. The arrest followed an encounter with the police near Bhakna-Chicha road late last night. The police also seized 6 kg of heroin worth Rs 30 crore in the international market along with a pistol and two live cartridges from the possession of the accused. His accomplices and wanted smuggler, Harjinder Singh of Dhanoe Khurd, however, managed to flee. The police had laid a trap at the designated spot following a tip off that the accused were coming after having received a consignment at some point on the barbed fence between India and Pakistan, Dr Kaustubh Sharma, AIG counter intelligence told mediapersons. “The accused had come to the spot to deliver the consignment on a motorcycle bearing the number PB-46-F-5961. Seeing the movement of the police party, Darbara, a resident of the border village of Dhanoe Khurd, fired four to five shots from a .30-bore pistol, which had also been smuggled from Pakistan," said Dr Sharma. The police party returned fire and overpowered the accused, he said. A case has been registered under Section 21, 25, 29, 61, 85 of the NDPS Act, and 307 of the IPC as well as 25, 54, 59 of the Arms Act. He said, "During initial investigations it was found that Darbara along with his accomplice Harjinder Singh were earlier associated with Kala Masih, a Pakistan-based smuggler, who was active in Ajnala sector and was arrested by the State Special Operation Cell in May this year. He had smuggled a couple of consignments of heroin from Pakistan to them." "After Kala Masih's arrest, Harjinder Singh revived his links with notorious smugglers in Pakistan and arranged for a consignment of heroin, which he and Darbara Singh received from Ajnala sector on the intervening night of September 23/24. The exact spot from which the consignment was pushed into India is being ascertained," said Dr Sharma. A manhunt has been launched to nab Harjinder Singh, who is absconding. "This is the first movie for me, Yugraj and Kajal and we wanted all the blessings for its success," said Jenny. The movie revolves around the theme of friendship and has an ensemble star cast of Arya Babbar, Harish Verma, Jividha Astha, besides the trio. Anurag Singh, who earlier has co-produced Mel Karade Rabba, is responsible for the story, screenplay and the direction of the film. For Arya and Harish, it's their second Punjabi film but Yugraj, the younger son of Punjabi music maestro Hans Raj Hans is making his debut with the film. The team is feeling the pre-release jitters. "Yeah. I consider myself lucky to be working with a professional team of actors and have high hopes from the film. It is a very feel good, fresh and peppy film and I hope the youngsters would like it," says the first-timer. He plays a shy, introvert yet strong guy in the film. "I could relate to the character as I am like that in real life too," he says. Having studied in England, following his father and brother's footsteps was the obvious choice and acting wasn't on the cards. "I'll call it destiny as I wanted to become a musician like my father but when I was offered the role I could not resist." Playing the lead female protagonist, Kajal Jain plays the role of a shy village girl. "It's a serious introvert kind of a role and weaves into a very cute love story between me and Yugraj," says Kajal. Another newcomer Jenny, playing the role of an NRI girl wasn't much of a challenge. "I have come from Canada and so was born an NRI. While growing up I have experienced the difference in the upbringing in both the countries and making it come out in front of the camera was not that difficult." With a number of Punjabi movies releasing every Friday, Yugraj believes that it is time Punjabi films enjoy popularity equal to Bollywood films. "We have new subjects, better production standards and young actors. All the ingredients to make successful box office entertainers," he says. Meanwhile, the young actor also plans to launch his music album. "It will be a mix of sufi and Punjabi music," he says. Like father, like son. The teachers had alleged that the office-bearers of the association had taken over a majority of the key posts in the university thereby ignoring merit. As per norms, if 20 or more members of the association object to any act of the governing council and submit their resentment in writing, the president can call a requisition meeting. Singh said, "An emergency meeting of the union has been called for tomorrow wherein the teachers would deliberate over some sensitive issues pertaining to the alleged discrepancies in promotions as well as the alleged autocratic attitude of the university authorities," he said. It is to note that the election for the association is due in November but looking at the unrest among its members, it is likely that the body may have to be dissolved in advance. Sources say the move is a result of a division among the association office-bearers, with the association president Singh being on one side and the remaining office-bearers on the other. The teachers have alleged that majority of the key posts are on an ad-hoc basis and the office-bearers, instead of opposing the move, grabbed the posts instead. "The management is flouting all rules with impunity but our representatives, which include those who had either held positions in the association in the past or had contested the elections, are quiet. Despite being qualified teachers, they did not hesitate to grab even the non-teaching posts only for a few thousand more. Apart from their regular salaries, they are pocketing the extra remunerations to the tune of Rs 5,000 a month in lieu of 'extending their extra services," the members said. To have the upper hand, the university management has put chief posts like that of the controller, examinations, director, distance education, dean college development council, dean academic affairs and other top slots in the departments of distance education, public relations, IAS centre, finance and development have been converted on an 'ad-hoc basis'. Tripta Kumari said the association would continue it strike till the government submits to association’s demand of revised pay scales recommended by the Fifth Pay Commission. The association has further demanded the implementation of uniform, washing and meal allowances. The ANMs and LHVs were used to play a predominant role in Pulse Polio campaigns. Due to their knowledge of localities they were deemed necessity in running a door-to-door campaign. She added that department is making every effort to complete the campaign in a smooth way. More than 500 booths have been set up in the city to administer polio drops to the children, she said adding that nursing students have been duly trained for the programme. The workers began the strike last week. Every attempt to reach a compromise failed. Civil Surgeon Dr Avtar Singh Jarewal “Strike has caused shortage of manpower, but we have taken services of students to run the campaign smoothly. Strike hits Pulse Polio campaign demanded the implementation of uniform, washing and meal allowances. The ANMs and LHVs used to play a predominant role in Pulse Polio campaigns. Due to their knowledge of localities they were deemed necessity in running a door-to-door campaign. Students can avail the chance to get their scores re-evaluated in July, after the results the declaration of the results for the annual examinations conducted in April. Even after a lapse of two months, the branch failed to declare the outcome of the re-evaluation. Prof-in-charge (Examinations) Prof RK Mahajan said the re-evaluation process took time because of the tedious process involved but it would be completed soon. He also assured that the students would be entitled to take the supplementary examination in case their re-evaluation result is awaited. “It is a very time-consuming job and cannot be completed in haste. We conduct the re-evaluation job in a very fair but secure manner. We engage two examiners and then their individual opinions are matched before declaring the outcome," he said. "The exact number of pending re-evaluation cases cannot be told right now. Yet the situation is not as grave as it appeared to be. We have almost completed our job. Moreover, the students, even if they could not get their re-evaluation results on time, can appear in the supplementary examination, subject to the condition that their eligibility for the next level would be assessed on the basis of the marks they obtain after the re-evaluation. Every student is entitled to have two chances for that and we are unbiased about it," he said. Dar said in the recent past, plush hotels have been targeted by terrorists in many countries in the world. He said keeping in view different environment in hotels, where employees were extremely polite and courteous with customers, orientation of them was also necessary. He cited instances of terror attacks at Mumbai’s Taj hotel and Jakarta’s Marriott hotel. Having worked in different geographical locations in the world, including, the USA, Latin America and Africa, Dar is now MAX Security Solutions Director (Consulting Division). He said the poor security set up could be disastrous. “You are safe if you are prepared”, he said and exhorted the hospitality industry to intake trained staff suitable to their condition. He said terrorists had devoted hours of reconnaissance of their targets before carrying out their diabolical attack. Similarly, the hospitality industry had to adopt full fledged trained security to meet any exigency. Meanwhile, in a major embarrassment to the state government in general and Amritsar Municipal Corporation in particular Ministry of Tourism Union Secretary RH Khwaja has expressed his dismay at unhygienic condition prevailing in the holy city. Addressing concluding session of three-day Hotel and Restaurant Association of Northern India (HRANI) here today, Khwaja said the moment he came out of the Amritsar Airport he observed piles of garbage. He said he had not seen these garbage mounds in many other cities of the country. He advised multi-department involved in the hospitality industry in the country to inculcate individual social responsibility then move on to family social responsibility and eventually to graduate to group social responsibility. He said these stages would ensure better results at home, on road, in institutions, society and country. He received a sum of Rs 75,000 after it was declared partially damaged by the Civil Surgeon’s Department. Similarly, this year a middle-aged Rani received a sum of Rs 60,000 after her husband Ram Lubhaya, also a handloom weaver, died a natural death. These are few names of those enterprising weavers who understanding the needs of their families took the initiative for being insured. Despite this, a large number of handloom workers are either oblivious of such welfare schemes or their employers never thought on these lines. As per the data with the Punjab Industries Department, the district has 1299 handloom units manufacturing carpets, duri, khes and khadi fabric, said General Manager Surjit Singh. He said that there were about 856 textile registered units producing suiting shirting textile, shawls, blankets and other. He added that there was no exact data on the strength of employees in these units. Textile units with an annual turnover of Rs 1,000 crore, including the Rs 500 crore share of the shawl industry, are major employers in the city. Besides, there are hundreds of unregistered handlooms, suiting shirting, blanket, shawls manufacturing units being run without any registeration and record in the shape of cottage industry in various parts of the city. The local units of the Left parties claim that over 5,000 weavers are working in 800 looms manufacturing shawls only. They claim that these workers were being paid on the basis of metres of cloth manufactured. Long power cuts are their major fear as they reduce their work output and hence their earning as well. Many of the workers are sole earners in the families. A weaver, Mohan Lal, said his monthly income had come down by more than half for the past over two months after power cuts were introduced. He said on an average he earned about Rs 4,000 monthly but long power cuts sometime bring down their pay and scarcity of resources at home. Two of his sons were studying in higher secondary classes. A majority of these units are situated at Batala Road, Chheharta township, Bakkar Mandi, Islamabad, Sultanwind, Dhapai Road, Khuh Bhalla, etc. Major grouse of these artisans was low wages, long working hours, costly education, inflation in essential commodities like eatables. Deplorable working condition was the last irritating factor. They said that if their domestic needs were being taken care of with good wages, they could take this in their stride. An artisan Nirmal Singh said that bare minimum facilities at the work places was a deterrent for youth in joining the profession. He said power loom and handloom owners were not finding enough skilled artisans yet they were not ready to offer pay commensurate to their long working hours. He said he worked daily for nearly 12 hours and his monthly salary never exceeded Rs 5,000. He said cramped rooms, unhygienic environment and absence of toilets were characteristic of these factories. Left leader Amarjit Singh Asal, who has been campaigning for the rights of power loom and handloom workers for long, said that owners of these factories never implemented labour laws. Attendance was never recorded, he said and added that every year wages of these artisans were increased only after an agitation. He said long working hours isolated these workers from their family and society. Unless the government framed labour laws and strictly implemented these there would be no improvement in their lot. VK Kohli, Textile Commissioner, Regional Office of Textile Commissioner under the Ministry of Textiles, said the Union government extended Group Insurance Scheme (GIS) to powerloom workers in case of natural death, accidental death, partial and permanent disability. He said, on an annual average about 4,000 workers enroll under the GIS. n The Powerloom weavers, aged between 18 and 59 years, engaged in the weaving on powerlooms and allied preweaving/preparatory activities, the self- employed weaver families owning not more than four looms will be eligible. n The scheme is operational on a yearly basis i.e. the premium paid will cover the applicant under this insurance scheme for one year. He can continue the insurance every year by paying Rs 80 premium up to the age of 59.
n The total premium is Rs 330, out of which Rs 250 would be extended by the Centre directly to the LIC and the remaining Rs 80 could be paid either by the employer or handloom weaver. n The benefits of the scheme included in the event of death of the member, sum assured of Rs 60,000 will become payable to the nominee. In the event of death by accident Rs 1.50 lakh, on partial disability Rs 75000, total permanent disability Rs 1.50 lakh. n	Besides, under the scheme the worker would also be entitled for educational grant under Shiksha Sahayog Yojana (SSY). Under the Yojana, the workers would be entitled to an annual scholarship of Rs 1200 per child for a maximum of two children studying between Class 1X and Class X11 for a maximum period of four years. Members of the Midday Meal Workers Union and Part Time Sewing Teachers Union today held a protest in favour of their demands in front of the residence of Social Welfare Minister Lakshmi Kanta Chawla. The agitating members maintained that they were being paid meager salary while the inflation was soaring at its highest level. For this, they flayed both Union and state governments. Earlier, the agitators gathered at Gole Bagh. Holding banners and raising slogans they marched to the minister’s residence. 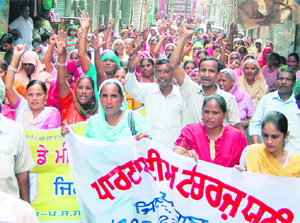 Midday Meal Workers Union President Gurmit Kaur said that it was difficult to make both ends meet under the present pay structure. She demanded that mid-day meal workers must at least be given monthly salary of Rs 6500. Baljit Kaur of the Part Time Sewing Teacher Union sought that part-time teachers must be offered monthly salary of Rs 10,000. She added that salary must be deposited in their accounts. She said all employees must be insured so that in any eventuality their families could be compensated. Members of both unions demanded regularization of the employees and grant of stipulated holidays like casual leave, medical and maternity leave. Encouraging young artistes to come out and let their creativity loose, the workshop is an effort to bring some action on the otherwise dull art scene in city. “Its emphasis is to promote art, especially young artistes who fall short on financial and promotional platform despite having the talent. We will provide our space as a studio for various artistes to work out their ideas and facilitate an open exchange of artistic sensibilities,” says Brijesh Jolly, director, KT Kala. 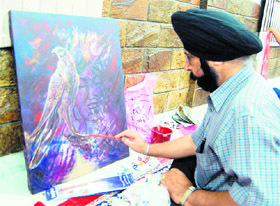 The three-day workshop is seeing participation of 18 artists from Amritsar alone. “The idea of having a workshop in city was conceived after the success of the recently organised camp by Panchrang, a group of artists from Amritsar in collaboration with Jammu and Kashmir Centre for Creative Arts. 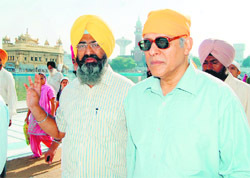 The event saw participation across three states of Punjab, Haryana and J&K. This time, we are inviting artistes from Punjab only,” says Jolly. Also, it will provide as the place to be for those studying art as the best collection of nationally and internationally acclaimed artistes will be on display for three days. “We will have known works of artistes like FN Suza, B Vithal and B Prabha along with some European artistes on display. Some known sculpture and other items of visual art will also be at display,” says Jolly. To further stimulate their creative receptivity, the gallery will have books and literature about Indian and other progressive art forms of the modern world. All the paintings made during the workshop will be displayed at the gallery itself and will add to the collection. Players topped in the age group of 5-8 year (boys), girls in the 8 to 10 year, boys in 8-10 year, girls in the 11-14 year, girls in the 19-25 year and girls in the 25-30 year age group.